We are all fascinated with celebrities. A desire for tales of fame and fortune, trial and tribulation and victory over defeat. Present day popular culture creates idols out of sports stars. And inversely, for many decades, sport has had an effect on modern popular culture. As an example, fashion now reflects sports clothing and it is therefore no surprise that sport apparel brands like Nike and Adidas earn yearly revenue in excess of $16 billion. Sports stars are constructed by the media, big businesses and ultimately human beings’ aspirations to emulate our heroes and heroines in some sort of form or manner. Paul Pogba is now one such sports megastar. Sports and business are linked with an unbreakable bond. The circle between sports, viewership (audience), business and consumerism is tied to billions and billions of dollars (or whatever currency is your preference). When David Beckham retired from football he was the most famous footballer and one of the most famous celebrities on the planet. His face and name was on everything from soft drinks to underwear to football academies. He had signed lucrative deals with Adidas and Pepsi amongst other brands. Beckham’s brand extension became so successful that it has set the benchmark for sports marketing. When new stars emerge, the romantic dialogues comes to the forefront. They can be conceived as characters set within certain narratives. Basically the media elevation of a sports star is part of a wider story which helps the individual connect with society. So step forward a few years after David Beckham, and with the added drive of social media, football appears to once more have a celebrity worthy of megastar status. In the clip above Pogba dances proudly showing off his Adidas United shirt. This is not only a perfect collaboration orchestrated by Adidas, it is a fusion of culture; mixing music, dance and sport. Whilst Pogba doesn’t have a Hollywood celebrity wife he is without a doubt the most marketable football player currently. Pogba has been the name on the entire football world’s lips since the end of the previous league season. Adidas used him in various other advertising campaigns through the transfer saga, bolstering ‘Brand Pogba’. The former Juventus midfielder spent his summer vacation in the US meeting up with Basketball stars, celebrity music artists such as Drake and causing a stir wherever he went and whatever he did. 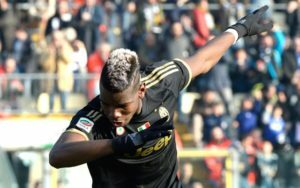 Social media was awash with “Where is Pogba now” and “What is Pogba doing”? Besides being an exceptionally talented footballer, Paul Pogba has been thrust into the limelight with a marketing scheme scalable beyond all measures. A transfer saga which lasted months eventually culminated with an inevitable outcome but importantly, it ended on the terms of a global brand, Adidas, and their new superstar. 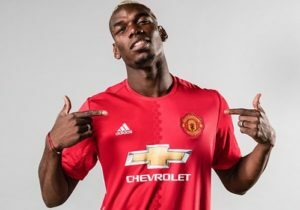 Paul Pogba is the new transfer world record man. Anywhere between €100 mill and €120 mill (depending on which source you quote) is what Manchester United paid for the 23 year old who they let go on a free transfer (receiving only small compensation due to his age) just 4 years ago. Somewhere in-between all of the above is a 23 year old midfielder who was a driving force during Juventus multiple Serie A titles and recent impressive Champions League campaigns. He possesses strength, athleticism, awareness, excellent ball control and a fierce shot (with both feet). His strength, athleticism and build is what drew comparisons with Patrick Vieira in his early days but the truth is he is much more than a defensive midfielder in the Vieira mould. Pogba still has a lot to prove but he is the real deal and can easily finish his career as one of the great midfielders. Whilst he has taken tremendous strides on the pitch already, it’s off the pitch where Pogba is only just beginning. It won’t be long before every single little kid in the red part of Manchester and millions more worldwide are dabbling in celebration of a #Pogback goal.